Francis Ford Coppola's epic masterpiece features Marlon Brando in his Oscar®-winning role as the patriarch of the Corleones. This is a chilling portrait of the Sicilian clan's rise and near fall from power in America balanced between the Corleone's family life and the crime business in which they are engaged. Awards: Won for Best Picture; Best Actor-Marlon Brando; Best Screenplay. Nominated for Best Director; Best Supporting Actor-James Caan, Robert Duvall, Al Pacino; Best Costume Design; Best Film Editing; Best Sound; Best Score-Nino Rota. DVD: Widescreen 1.85:1/16x9; audio English Dolby Digital 5.1, French Monaural; subtitles English; closed-captioned; single sided - dual layered; 23 chapters; rated R; 175 min. 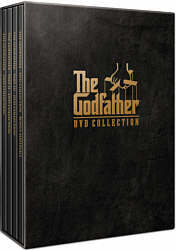 ; $99.95 - available only as part of The Godfather DVD Collection; street date 10/09/01. Supplements: Audio Commentary from Director Francis Ford Coppola. As with many classic movies, I doubt that the folks behind 1972’s The Godfather had any idea what a monster they’d create. At the time, mafia movies were a virtual non-entity. Though the film was based on a hugely successful novel, the Mario Puzo text was largely seen as a sensationalistic piece of work; while a film version might do good business, it didn’t seem like the stuff from which a classic would emerge. 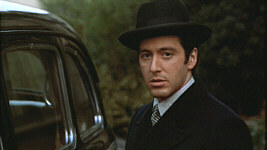 Nearly 30 years later, the genre started by The Godfather remains more popular than ever. Through films like GoodFellas and TV shows like The Sopranos, gangsters continue to fascinate folks, and the field shows no signs of abatement. While some of these other works are quite good, the Godfather series persists as the big dog. It’s the Beatles of mafia media. Over the course of my three reviews - which will also include 1974’s The Godfather Part II and 1990’s The Godfather Part III - I’ll discuss the merits of each entry, but whatever praise I’ll offer for the sequels will not fully equal my accolades for the first film. Many argue that II was the best of the bunch, but I don’t belong to that club; it’s a very close call, and I admit that as time goes on, I see II’s merits more clearly, but I feel The Godfather offers the most satisfying and compelling entry of the series. 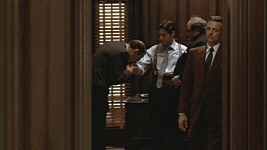 Set right after the end of World War II, The Godfather examines the Corleone family over a decade. 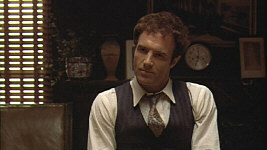 Father Vito (Marlon Brando) runs a large and powerful crime syndicate, and sons Sonny (James Caan) and Fredo (John Cazale) also are involved, though the latter - who lacks much brain-power - only plays a tangential role; hot-headed Sonny is a integral part and seems to be the don in training. Third son Michael (Al Pacino) - a returning war hero and the only college man of the bunch - disdains his family’s illicit ways; he’s close to them but he wants to distance himself from the crime. 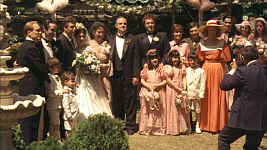 The film starts during the wedding of the only Corleone daughter, Connie (Talia Shire). From there we get a feeling for the family business and a larger plot emerges in which competition develops between the Corleones and other mobs in the area; mainly this revolves around potential drug trade, which Vito opposes for his family. Inevitably, greater conflict ensues, and rivals attempt to kill Vito. They fail, although the violent shooting leaves Vito a shell of his old self. However, this action brings Michael closer to the family business, and the remainder of the film examines his additional involvement and the rest of the gang warfare. Many people seem to view Vito as the center of The Godfather. Brando won an Oscar for Best Actor based on his work here, and his image permeates most of the publicity materials attached to the film, including this DVD. However, I think such determinations are incorrect. 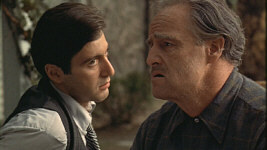 To be certain, Vito plays a major part in Godfather, but his story is not central to the plot. Instead, it’s Michael who remains the focus of the tale. I suppose this seems more obvious in retrospect, since the film’s two sequels concentrated even more heavily on Michael, but it feels apparent even based just on a viewing of Godfather alone. Of all the characters, Michael’s the only one who actually changes, and he grows in stature as the film progresses. Are the alterations positive? No, but that makes them all the more significant, as Michael becomes sucked into the nasty side of life against his will. As Vito, Brando offered a fine, iconographic performance that stands as probably the most famous of his career; his work in 1951’s A Streetcar Named Desire is also quite well-known, and his role in 1979’s Apocalypse Now maintains a high level of awareness, though not for positive reasons. Nonetheless, Vito remains his signature part, and he brought a great deal of force and presence to the role. In retrospect, the power he contributed makes it seem like Vito’s onscreen more than he is; as was the case with Anthony Hopkins’ work as Hannibal Lecter in 1991’s The Silence of the Lambs, a great actor created a role that transcended time limitations to dominate a film. However, Brando really was just a supporting actor, and Pacino was the lead, though their Oscar nominations reversed that status. Though not as commanding as Brando’s Vito, Pacino’s Michael is really a stronger performance. Michael goes from a fairly innocent and likable guy to someone totally detached from his emotions by the end of the film. Pacino had to take us through the levels of progression, and he did so smoothly and believably. He never resorted to hamminess or any forced emotions, which made the performance all the more chilling; it seemed as if we could actually see the blood drain from Michael as the movie continued. While Brando and the rest of the cast certainly were terrific, Pacino was the empty heart at the movie’s center who gave the film depth. When I review Godfather II, I’ll more fully compare and contrast the first two films, but I must admit that objectively, II probably is the superior flick. So why do I continue to prefer the first Godfather? Simply because it offers the more entertaining and memorable experience. Almost all of the images we associate with the series appeared in the initial film; both sequels added a little to the lexicon, but when most people think of the series, it’s Godfather they remember. II surpasses the first movie through its complexity and depth, but the first flick wins the competition due to its heart - or lack thereof, toward the end of the story. Some parts of Godfather seem a little slow at times - I never much cared for Michael’s stay in Sicily - and others don’t flow tremendously well, but the overall impact appears strong. After almost 30 years, The Godfather continues to provide an exciting, dramatic and compelling experience; it’s one classic that deserves its status. The Godfather appears in an aspect ratio of approximately 1.85:1 on this single-sided, dual-layered DVD; the image has been enhanced for 16X9 televisions. The disc sported an erratic picture that often looked quite good, but it also displayed a mix of flaws. Sharpness usually seemed quite strong. A few shots - mainly low-lit interiors - showed some minor softness, but these occasions were rare. For the most part, the image appeared to be nicely crisp and detailed. I saw some examples of moiré effects, usually due to car grilles, but jagged edges weren’t a concern, and only some minimal edge enhancement seemed apparent on occasion. 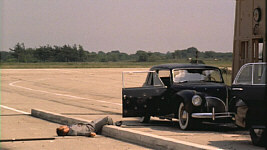 Most of The Godfather featured an extremely drab palette. The movie mostly went with a very brown look, so more vibrant colors were rare. When those hues did appear, however, they seemed surprisingly vivid and bright. Through flowers, Kay’s orange dress at the wedding, and a mix of other elements, we saw some rather solid colors at times. Make no mistake, however; the movie was almost monotone for much of its running time, so don’t expect a Technicolor extravaganza. Black levels mainly came across as nicely deep and dense, and contrast was fairly good for the most part. As noted in the prior paragraph, much of the film looked rather brown and dark, and shadow detail usually seemed up to the task. Most of the low-light situations appeared to be appropriately heavy but not excessively thick. Some of these shots did come across as somewhat flat and dim, but as a whole, I thought they looked fairly solid. Where The Godfather encountered most of its problems related to print flaws. Most of these remained pretty minor. Light grain cropped up occasionally throughout the film, but it usually appeared during low-light sequences, when it would be most expected; a few daylight shots - such as those between Michael and Kay at the wedding - also demonstrated grain, but those instances seemed rare. A few nicks, some grit, and a blotch or two also occurred. What caused more concerns, however, was the surprisingly high number of little white speckles that showed up during the movie. The density of these dots varied, and the image did become cleaner as it progressed; the first half definitely displayed more of them. However, they remained a consistent distraction throughout the film, and I really was surprised at how dirty the disc could look. Ultimately, many parts of The Godfather looked very good, and as a whole the DVD offered a good representation of a visually difficult movie; the brown tone of the piece meant it would never be an attractive picture. Nonetheless, I must admit I thought the picture was a disappointment as a whole, mainly due to the relative lack of cleanliness seen. I expected less of the film’s Dolby Digital 5.1 soundtrack, but it also let me down nonetheless. The audio remixed the original monaural stems, and the results weren’t terribly pretty. Actually, as with the picture of The Godfather, the soundtrack combined some highs and lows, but the discrepancies seemed even wider. On the positive side, the mix attempted a pretty wide soundstage. The audio stayed primarily located in the forward spectrum, but it spread elements out across the front speakers. Quite a lot of ambient effects cropped up in the sides, and the music showed nice stereo separation as well. Surround usage appeared minimal for the most part. During a few scenes - such as those that involved trains or planes - the rear channels kicked to life fairly nicely, but for the most part, nothing more than general reinforcement came from the surrounds. Although some of the five-channel imaging worked well, for the most part I found this to be an awkward mix. Elements were usually placed abruptly in their locations, and they tended not to blend together very well. This left a forced tone to the mix that made it somewhat distracting; it rarely sounded natural or particularly real. Musical elements meshed together pretty nicely, though, even when they weren’t parts of the score; for example, a saxophone played in the street fit in well. Effects integration remained less successful. However, I could excuse most of those flaws, as I don’t expect a 5.1 remix to seem tremendously well integrated. Most I’ve heard have seemed superior to this, but it remained within the norm. Unfortunately, the audio quality caused more concerns. Some elements sounded good, and those were what kept me from giving the mix a below average grade. The music usually demonstrated pretty solid fidelity. At times the score appeared a little crackly and distorted but for the most part I thought the music seemed fairly clear and bright. The score also boasted some rather nice bass response at times. The climax showed good depth to the work. A few of the effects elements also came across as pretty powerful and dynamic. When Tom Hagen’s plane lands in LA, and when the train roars by while Michael’s in the restaurant, I found the track to offer good reproduction and force to these bits. Another scene in which thunder roars provided solid breadth and depth. However, much of the rest of the track suffered from a rather artificial and processed sound. It appeared that someone went nuts with the reverb filter, as much of the movie provided a thin, echoed sound. This effect seemed to occur to provide the mix with a sense of ambience, but it went way out of control; almost everything echoed, and it became a definite distraction. While the mix suffered from the awkward integration of some elements, it was really the weak sound quality that made the track seem so problematic. The piece felt unbalanced, as some parts appeared too prominent because of the processed sound. For example, the fireplace in Woltz’s house played much too strong a role during the dinner sequence; its pops and buzz drew attention to themselves in a problematic manner. When Johnny Fontaine sang during the wedding, the girls’ screams came across as synthesized; on the Bowie song called “Zeroes”, some artificial squeals appeared, and the two sound a lot alike. Another example related to the sound of people walking in the street. Instead of making this a small element, the footsteps became rather loud and obvious, and they took away from the overall impression; I didn’t pay as much attention to the important action because I focused on those stupid feet! Dialogue also suffered from the same reverberated quality, and many lines showed moderate edginess as well. Most of the movie seemed easily intelligible, though a few louder scenes could be tough to understand; for example, one fight between Connie and Carlo forced me to activate the subtitles to hear what they said. Distortion wasn’t a major concern throughout the movie, but it occurred more frequently than I expected, and I also heard a few fairly loud pops early in the film. In the end, The Godfather didn’t offer a terrible soundtrack for its age, and a few aspects worked very well. However, these were marred by many problematic parts that made the audio seem somewhat weak even for an older film. Although I usually like 5.1 remixes of monaural stems, I really wish this DVD included the original mono soundtrack, as it would lack the distracting artificial quality of the awkward soundfield. A couple of subtitle notes: for one, purists will be happy to hear that the original “burned-in” English translations appeared during scenes that featured Sicilian dialogue. While the movie only provided English subtitles for most lines, an option provides French text translations to appear on top of the burned-in English words. This feature appears automatically if you select the French soundtrack. 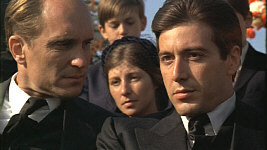 If you examined my grade for the supplements of The Godfather, you noticed that I didn’t give it one. That wasn’t because the disc included none. However, The Godfather can be purchased only as part of a boxed set that also include its two sequels as well as a DVD devoted totally to supplemental materials. I didn’t think it was fair to rate this disc’s extras in isolation, since it wasn’t meant to stand on its own. As such, a review of the whole “Godfather DVD Collection” will appear that grades the total package. However, I will presently discuss the one extra found on the Godfather DVD. 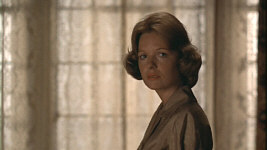 We find an audio commentary from director Francis Ford Coppola, who provides a running, fairly screen-specific affair. Although the track suffered from a fair number of empty spaces, I had little problem with the gaps, largely due to the length of the movie itself; at nearly three hours, that’d be a lot of room for Coppola to cover alone. I also didn’t mind the blanks too much due to the quality of the commentary itself. I wouldn’t call this a great track, but Coppola offered a lot of solid information and he did so in an engaging way. In a refreshing move, he mainly covered problems encountered during the making of the film. Many commentaries suffer from “happy talk” syndrome, but that definitely wasn’t the case here; Coppola never seemed petty or bitter - he who laughs last and all that - but he did relate the difficulties he encountered in a frank manner. Ultimately, he added a lot to the table during this interesting and informative commentary. 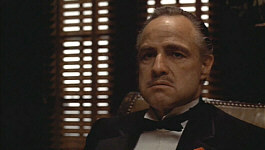 The Godfather earned the third position on the American Film Institute’s list of the Top 100 films. Almost 30 years after its initial release, I find it hard to strongly quibble with that choice. The Godfather remains a very solid piece of work that succeeds on almost all levels. Unfortunately, the DVD seems less satisfying. Picture quality is erratic but generally good, while audio appears rather artificial and thin. A good audio commentary from director Francis Ford Coppola adds a nice level of information to the package. While I found picture and sound to be disappointments, I remain reasonably pleased with the DVD treatment of The Godfather, and recommend it. As previously noted, The Godfather can be purchased only as part of a set. This box also includes The Godfather Part II and The Godfather Part III as well as a disc devoted to supplemental materials. Any discussion of possible separate releases falls squarely within the realm of speculation; no official sources have even hinted of such a possibility.